Health and Safety is often viewed as an overbearing legal requirement for companies to implement. Too often this is due to the poor implementation of existing OHS systems that are not designed to complement the company’s activities and increase productivity. Workers stay with safety orientated companies for longer: they feel valued, safer in the workplace and drive increased productivity by planning and executing work activities efficiently. HR benefits from a reduced turnover of staff reduced insurance claims and reductions in absenteeism from accidents, injuries and ill-health. Companies benefit from the retention of a competent workforce, reduced training costs and the reduced potential for civil and criminal cases when it all goes wrong with a fatality or serious injury on site. The costs associated with implementing good health and safety practices can easily be offset by the benefits highlighted above. 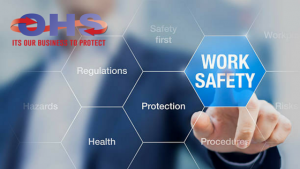 Companies classified as high risk are required to develop, implement and maintain an operational Occupational Safety and Health Management System to manage the OHS hazards and risks of their operations in full compliance with the OSHAD SF. If classified as low risk a basic OSH Management System is still required to be implemented with limited annual reporting requirements. THE FINDINGS FROM THE GAP ANALYSIS WILL THEN ALLOW MANAGEMENT TO DECIDE ON THE FOLLOWING THREE OPTIONS. This is the second cheapest option, however, if you rely on a low-cost option to get your company through OSHAD approval you will probably have wasted your time and money and need to start again. Get it right first time, submit your OSHAD registration with the knowledge that you will get approval. Failure to gain OSHAD approval will restrict your companies tendering success if you cannot renew the company trade license or demonstrate registration with OSHAD. Training existing staff to fulfil the requirement of HSE Officer or similar will not work. It is time-consuming and expensive with no guarantee that staff will be proficient once qualified. High-risk entities require at least one A Grade OHS professional to manage OSHAD requirements, typically they are required to have 11 years OHS experience in addition to an OHS Diploma or Degree qualification. The minimum requirement for all registered OSHAD practitioners is NEBOSH IGC or equivalent. In conclusion, if you want to make your business a success embrace best OHS practice. Use specialist consultancies such as Corporate OHS Limited to improve the operations of your company and make the workplace safer.